I’ve mentioned here before about the food blog community being a tight knit group…one that unifies for a number of things, including when one of its members is dealing with sudden tragedy. Unfortunately, this is one of those posts for one of those times. On Thanksgiving morning, Annie from Annie’s Eats received a heartbreaking phone call. Her father, only 59 years old, passed away unexpectedly. Many of us who know her virtually have offered to dedicate a post to her for comfort and healing, as a way to show our sympathy and pay our respects. A bowl of anything warm usually makes people feel better, even if only temporarily. I thought this dish would be appropriate to send Annie’s way during this time. I can only imagine how she’s doing during a time like this. Annie, you are in my thoughts and prayers…I hope your family can find some peace soon. Add oil to a large dutch oven, then place meat in (working in batches if necessary). Let sit on each side for 2-3 minutes until golden brown. Set aside in a bowl, pouring juices on top. Cook onions with a pinch of salt (add a teaspoon of oil if necessary) until translucent and brown around edges. Add mushrooms and another pinch of salt, and cook until golden brown. Add celery and cook until just softened. Add garlic to middle of pot (push cooked veggies to sides) and saute for about 30 seconds. Add thyme and bay leaf, and mix all together. Pour wine into pan to deglaze, scraping up bits from bottom of pot. Let wine reduce until most has been absorbed by veggies. Add meat and drippings back to pot. Pour in stock, then add enough water to just cover ingredients about half an inch. Bring to a boil, then reduce heat to simmer and cook for about 1 hour, covered. Add barley and cook for another 45 minutes, until barley is cooked and meat falls apart when pierced with a fork. Add salt and pepper to taste. 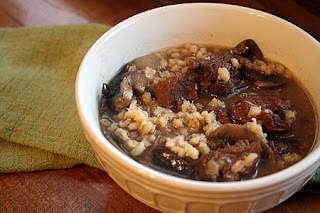 This entry was posted in barley, beef, freezer friendly, main dishes, make ahead, mushrooms, stew. Bookmark the permalink. What a sweet and heartfelt post. I love how the food blogging community unites during things like this. It makes me proud to be part of it. A very comforting dish for Annie, I’m sure. You have a generous soul. Melissa, thank you so much for this lovely post. The stew sounds wonderful and I truly appreciate the gesture. I made this last night for dinner and it was wonderful! I used my uncle’s homemade cab sauv wine, which gave it a nice sweetness. This is a great recipe for a cold night in December. Great job, Melissa!